Bilbao’s Guggenheim Museum turns 20 next year. It is no exaggeration to say that this was the cultural landmark that truly put the Basque city on the world’s travel map. It’s an unlikely story – the tale of how the ultimate repository of contemporary art revived the fortunes of an area almost wholly synonymous with the post-industrial slump. That sort of neat summation can be a little unfair, suggesting that Bilbao has nothing else to offer the traveller than Frank Geary’s architectural masterpiece. That view would be entirely wrong. There are, in fact, dozens of reasons to visit Bilbao – its cuisine, its coastline, its history and, above all, its clear sense of wonderment at just how it pulled itself up quite so dramatically by its bootlaces. To truly understand it, though, Bilbao has to be seen in context. First of all, it’s not so much in Spain, as it is in the Basque Country (an area that has also co-opted a corner of Southwest France). They do things differently there. Years of repression under General Franco failed to eradicate the region’s unique sense of identity. In fact, it served to reinforce it. Remarkably, when the Guggenheim was first planned, the development attracted opposition from staunch separatists. Back then, appealing to tourists was very low on the region’s priority list. Neither was it a must-visit destination for even the most intrepid traveller. If your experience of Spain is strictly limited to the baked Mediterranean shores of Andalucía, then you may mistakenly assume your waterproofs will be surplus to requirements on any visit to the rugged northern coastline. This, though, is green Spain. We’re not talking conservation here, but rather celebrating the lush and verdant landscape that comes courtesy of its distinctly oceanic climate. In keeping with a number of countries – Wales and China for example – you will also need to get used to the dual language road signs over here. Bilbao is actually Bilbo in Basque – a transition that will no doubt delight any Hobbit habitués in your retinue. These days, Basque is once again taught in schools but most conversations, especially with tourists, are conducted in Spanish or, better still, English. As is only right and fitting, let’s get the Guggenheim out of the way before even considering what else is on offer. The building really is an architectural triumph, fusing titanium, glass and limestone into a bewitching cauldron of swirling edges and surfaces that defies a single interpretation. It is, however, popularly held to resemble a boat – given that it’s been shoe-horned into Bilbao’s once dilapidated port area, it’s a theory that clearly holds water. While the art on display within stands comparison with the best on offer from any international gallery anywhere, it’s the exterior – entrance fee-free – that really stays in the memory. Take Jeff Koon’s Puppy – a 13-metre-tall living plant sculpture of a West Highland terrier. Or Anish Kapoor’s imposing Tall Tree & The Eye, a stainless steel and carbon monolith. Or – possibly the most eye-catching sculpture of them all – the nine-metre-tall Maman by Louise Bourgeois. Arachnophobes, however, may want to give this latter one something of a miss. Kick-started by Geary’s vision, perhaps, art is now everywhere in the city – from the curved-glass Metro stations (designed by Sir Norman Foster) to Philippe Stark’s Azkuna Zentroa, a multi-purpose leisure complex fashioned from the remnants of what was a former wine warehouse. 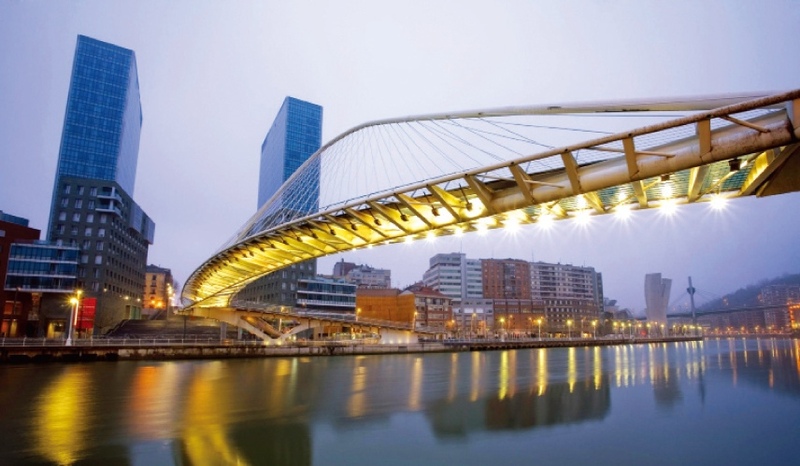 It’s best to get your bearings by referencing the 165-metre high Iberdrola Tower, then stroll across the iconic Santiago Calatrava-designed Zubizuri (Basque for white bridge) spanning the Nervión River. The development, though, is never-ending, rolling out at a seemingly unrelenting pace. Next on the agenda for the city – and surely the perfect excuse for a subsequent revisit – is the late Zaha Hadid’s housing and workspace masterplan, an initiative designed to regenerate the central Zorrotzaurre peninsula. As impressive as all of this modern architecture might be, Bilbao clearly cherishes its history, and there is no finer antidote to all of this steel and glass new build than a visit to its atmospheric Old Town (Casco Viejo), the place where it all began some 700 years ago. The city’s seven original streets – Las Siete Calles – are dominated by the 14th century Gothic Catedral de Santiago. Here it is all too easy for you to while away the hours shopping, drinking and checking out the various markets. The place to head to, though, is the Plaza Nueva, the large square at the heart of the Casco Viejo. Once there, surrounded by its array of bars, music and entertainment, you may never actually want to leave the place. 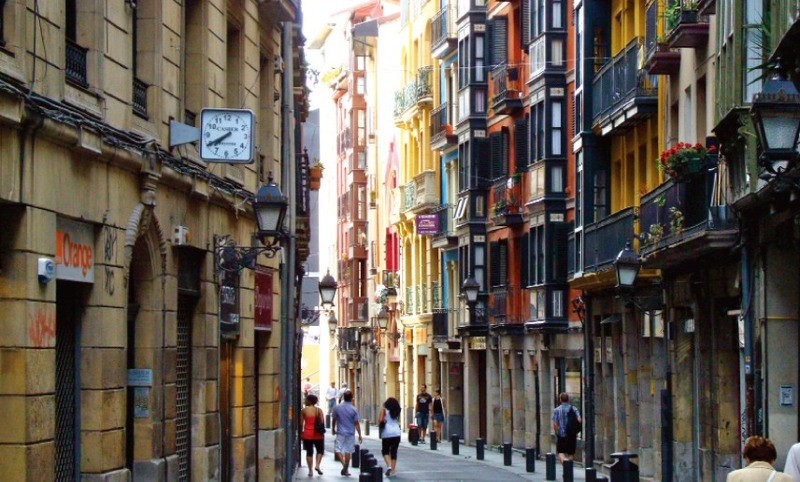 It is Bilbao’s very compactness that makes it the perfect city for touring on foot. Before setting out, you can get a good idea of the layout of the city by taking the funicular railway to the peak of Artxandako mountain. The entrance to the 100-year old funicular is just across the Zubizuri. It only takes three minutes to complete the ascent, but the panoramic views are perfect. From there, you can even pick out the Dona Casilda Iturrizar Park, complete with its ornamental duck pond. Moving on to the food front and, while many people have sampled tapas, few have experienced Bilbao’s unique take on these savoury appetisers. Here’s your chance to treat yourself to pintxos (pinchos). These are not only bigger than tapas, they’re also considerably more elaborate. “Pincho” literally means spike or thorn and here refers to the skewer that keeps these loaded snacks pinned together. The idea is to go from bar to bar, sampling one to two in each locale, all normally washed down with a glass of txakoli, a local sparkling wine. This is poured from a height – something requiring considerable skill – in order to ensure its characteristic fizz. 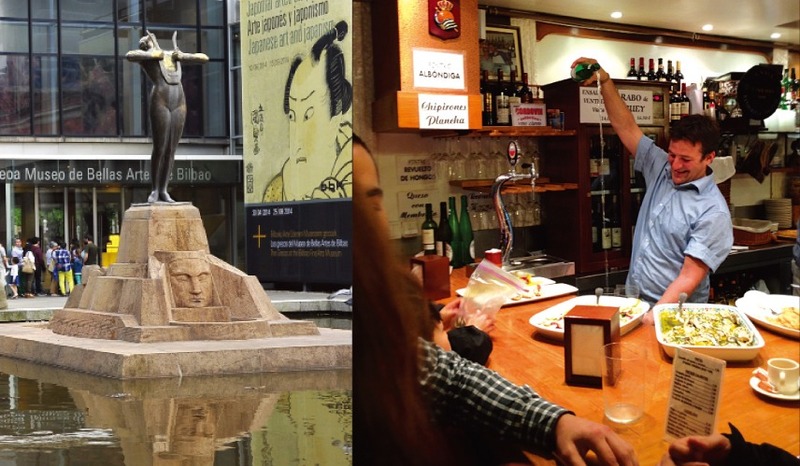 In fact, to do it properly, you should really embark on a txikiteo – a pinxtos pub-crawl. Thankfully, there never seems to be any shortage of them to join. You don’t have to restrict yourself to snacks, of course. 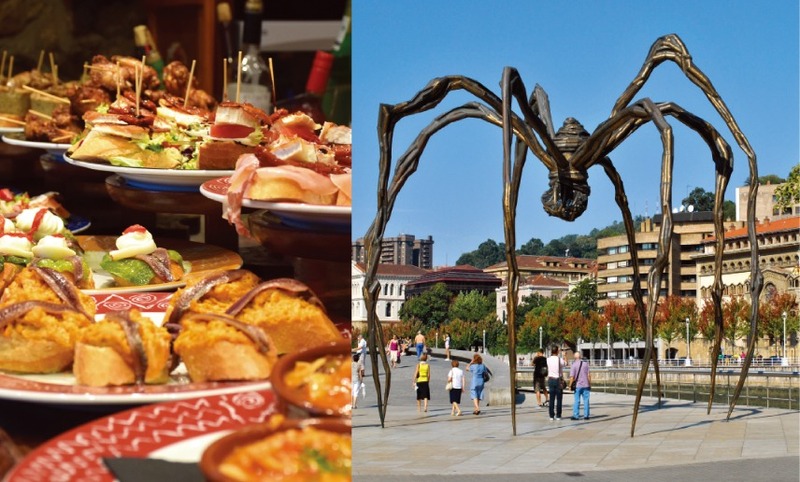 The Basque country is an absolute foodies’ paradise, with numerous high-end restaurants to choose from. Check out Etxanobe, Nerua or Arbolaguna in Bilbao itself or, if you feel like really treating yourself, then try and book either Arzak or Mugaritz (San Sebastian) – both of which are staples on most guides to the world’s Top 20. Don’t just make the trip to San Sebastian for a posh meal though. An hour away from Bilbao by road (or via a private tour operator such as www.basqueleisure.com), San Sebastian shares European Capital of Culture status with the Polish city of Wroclaw this year. Perched on the edge of the Bay of Biscay, this small city – about a third of the size of Bilbao – exudes real period charm and true elegance, all combined with a stunning backdrop. The sweeping Playa de La Concha and Playa de Gros, a surfer’s paradise, provide memorable – if breezy – beaches to while away the time, while a walk through the old town (Parte Vieja) reveals no less than two cathedrals, as well as a magnificent former casino (built in 1887 and now council offices). It’s the coastal road, on the return stretch to Bilbao, that offers the most arresting and awesome vistas. Stop off in the coastal fishing villages of Getaria and Zumaia for the best views out to sea, giving you a chance to glimpse hidden beaches and sensational cliff formations as the mountains of Bizkaia tumble precipitously into the crashing surf. By way of a complete contrast to these dizzying natural formations, be sure to pay a visit to the black-glass clad museum dedicated to Getaria-born Cristóbal Balenciaga. This couturier and designer is now regarded as one of the most influential figures on the 20th century fashion scene. Having blown off the cobwebs with a little sea air, now would be a good time to begin exploring the Bilbao beyond the Guggenheim – and the Bilbao Fine Arts Museum is the ideal place to start. With a collection of some 10,000 works, including paintings, sculptures and applied arts ranging from the 13th century to the present day, it certainly merits your attention. As you might expect, there’s a distinct emphasis on the sculptors and painters of the Basque region, most notable amongt these are Eduardo Chillida, Jorge Otezia, Ignacio Zuloaga, Jesus Mari Lazkano and Agustin Ibarrola. If it’s raining – and there’s every chance it will be – you can still learn about Bilbao’s seafaring past while keeping dry at the Museo Maritimo Ria or even take a crash-course in Basque history at Museo Vasco. Don’t expect too much of the information to be in English, though, at whichever one you choose. There’s also a busy calendar of classical and rock concerts taking place in the city – search the Euskalduna Centre, the Arriaga Theatre and the Bilbao Arena for latest listings of upcoming events. Unsurprisingly, sport is yet another channel for the region to express its singular identity. The city’s football club, Athletic – not Athletico, which is way too Spanish – Bilbao selects only players born in the Basque country. They’re yet to face relegation from the premier division and only Real Madrid, Barcelona and Athletico Madrid have won more La Liga titles. In the era of the galacticos just imagine how your team would fare if it only fielded local boys. Athletic recently built a new stadium – San Mamés – next to its old home and can now accommodate more 50,000 of their ever-passionate supporters. If you’re looking for a more unusual pastime, then check out pilota (pelota in Spanish) a court game that can be played between a sliding numbers of players all wielding a variety of different bats, rackets and handball techniques to wallop a hard leather projectile about the place. The Basques love it, of course. They did invent it. Then there’s the bullfighting. Despite a number of neighbouring regions – notably Cataluña – banning corrida de toros long ago, Bilbao stubbornly adheres to this bloody tradition. The local bullring hosts one week-long meeting every year, normally in August. It’s worth checking the dates in advance. If only to ensure you miss them by a comfortable margin. Deservedly, Bilbao is proving itself an increasingly popular travel destination. While the Guggenheim dominates, it would be a poorly prepared visitor who restricted himself to this one – admittedly wondrous – highlight. The acid test of how you’ve taken to Bilbao will ultimately depend on your answer to one particular question once you’ve returned home – where have you been? If you’re still saying “Spain,” then you’ve rather missed the point. If, however, you say “The Basque Region,” with a distant faraway grin, you’re clearly a convert to the cause.